"Mundanity" looks at sculptural objects that seem familiar in an everyday sense. Some are made of thrown-away materials - paint can lids, old garden hoses or cast-off tools; others are representations of common objects, re-made in traditional sculptural materials - a plaster form with gold leaf, cast glass potatoes, an iron and candy in cast iron, and wooden limbs. All of the artists work with the history that even the most basic objects accrue, uncovering meaning and delight in the quotidian materials and mundane moments that make up our daily lives. On behalf of the Tubman-Mahan Art Gallery of the Center for Green Urbanism, Authentic Contemporary Art is inviting artists to submit artwork for ReCREATE. This will be the inaugural exhibition of the Gallery and will showcase artwork that is made up of recycled or recyclable materials. It will coincide with the Center's official Grand Opening, scheduled for Friday, October 15, 2010. Open to U.S. artists 18 years and older. ReCREATE focuses on art created from items that are normally thrown away but can be recycled. Recyclable or recycled objects must be incorporated into the artwork. Recycled items may include any materials that are man-made or organic, including but not limited to wood, metal, glass, sand, paper, pottery, fiber, and plastic. This includes two and three dimensional work such as paintings, works on paper, sculpture, glass work, collage, mixed media, assemblage, metal, stone, etc. Paintings or artwork created with eco-friendly paints, dyes, etc., are also acceptable. ENTRY FEE: $25 for up to 3 entries. All submissions must be postmarked by September 10, 2010. Please join Hillyer for a miracle berry closing of Corwin Levi's and Pam Rogers' August exhibitions. If you haven't seen their unique artistic takes on the natural world, trying a miracle berry along with an assortment of unusual foods and alcohol is your perfect opportunity. (For more information on miracle berries, see here for more information. Sponsored by Clarity Law Group, a law firm that specializes in small businesses and takes pride in a left-brain/right-brain culture that encourages creativity. Miracle berries are first come, first serve until they run out. 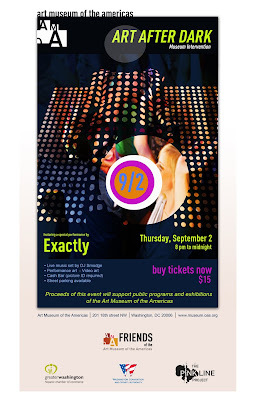 Washington, DC – The Washington Examiner’s ARTS ON FOOT sponsored by Wines of Argentina is back for the 18th year to kick off the upcoming fall arts season. The four-day event in Penn Quarter will showcase visual and performing arts, culture, and cuisine, and include interactive experiences for all ages. The Washington Examiner’s ARTS ON FOOT, centered at 7th and F streets, NW, takes over four blocks with expansive programming. The event opens with a juried fine Art Market featuring 50 artists and live entertainment from Wednesday, September 8 through Friday, September 10 from 11:00am to 7:00pm daily (on F Street between 7th & 9th). Artists’ work for sale includes ceramics, jewelry, painting, photography, sculpture, woodworking, clothing, and more. Music performances throughout market hours include renowned local artists Flo Anito (jazz-pop), Dave Chappell (guitar), Janine Wilson & Max Evans (acoustic roots), Seth Kibel (instrumental jazz), and The Sweater Set (folk). This year, Alternative Arts Spaces sponsored by Westwood College are reintroduced to the event’s lineup. Arts organizations will produce exhibits in unconventional venues, converting vacant space into temporary galleries throughout the four days. The festival takes place on Saturday, September 11 from 11:00am to 6:00pm, adding two additional blocks (8th Street between E & F, and F Street between 6th & 7th) for more cultural and creative programming. First, an additional 50 artists join the market to offer an even wider variety of fine art and crafts. Eclectic lineups of music and dance on the Performance Stage sponsored by Ford and the Museum Stage include Grammy-nominated Christylez Bacon (progressive hip hop), CariTango (tango), Dizzie Miss Lizzie’s Roadside Revue (musical theater), Gina DeSimone & the Moaners (swing), Kid Goat (indie rock), Memphis Gold (classic blues), and many more. This week's featured artwork deals with layers. Layers of meaning are present in friendships we make, cultural identities and in an awareness of other living systems in the world. CALL TO ARTISTS. Applications are now being accepted from artists interested in participating in the Dupont Circle Fine Arts Show taking place on Sat, Sept 25, 2010, from 2 to 6pm on 17St., NW. This event is being sponsored by the Dupont Circle Citizens Association (DCCA) in conjunction with the Area Neighborhood Commission2B (ANC2B). Interested artists should go to http://www.dupont-circle.org/17StArtFest and download an application form and informational sheet. Washington Studio School is holding their Fall Open House THIS SUNDAY, August 29th, 1-3pm. Tour the school, meet the faculty, sign up for classes and take a FREE DRAWING CLASS. Classes at Washington Studio School for the Fall Term begin after Labor Day, Tuesday, September 7th. Fall 2010 Term Schedules are now available and registration is open. Live Music set by DJ Smudge. Buy tickets here for $15. Performance by WE ARE SCIENCE! YOUNG BLOOD Talks & Performances This Thursday @ MAP! Work by recent Baltimore-area MFA program graduates. Organized by MAP’s Program Advisory Committee. Reception, gallery talk, and special performances by Natalia Panfile and Christine Ferrara. Friday, August 27th is the last day of the Black & White ceramics exhibit. 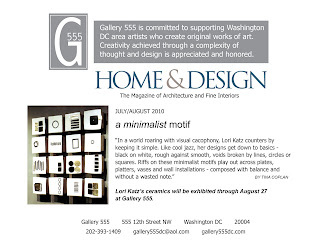 Lori Katz's exhibit has been extremely successful thanks in part to the article on her in this months Home and Design. The Page-to-Stage festival is made possible by The Morris and Gwendolyn Cafritz Foundation. FREE! No tickets required, limited seating available. The Kennedy Center hosts its ninth annual Page-to-Stage festival, featuring more than 40 D.C.-area theater companies. This three-day event offers free readings and open rehearsals of plays and musicals being developed by local, regional, and national playwrights, librettists, and composers. Don't miss your chance for a first look at outstanding works for upcoming season premieres! General admission seating opens approximately 30 minutes prior to each event. Programs, artists, and schedules are subject to change without notice. No free parking for free events. White Noise by Tom Block follows Tim, an African American painter, as he struggles with inner demons, an increasingly bizarre exterior reality, and a scantily clad Simone Weil, a historical figure that metastasizes as a figment of his own imagination. Having abandoned true faith, Tim grasps for "faith in faith" and in the end finds dubious consolation, alone in a bathroom. Metro will close five Red Line stations during the Labor Day Holiday weekend from 10 p.m., Friday, Sep. 3, to closing on Monday, Sep. 6, as the agency undertakes a major rehabilitation and rebuilding project to improve safety, comply with a recommendation made by the National Transportation Safety Board (NTSB) and maintain service reliability and a state of good repair. The Takoma, Silver Spring, Forest Glen, Wheaton, and Glenmont Metrorail stations will be closed during the Labor Day Holiday weekend. Normal service will resume on Tuesday, Sep. 7, at 5 a.m. Metro will operate free shuttle bus service between the Fort Totten and Glenmont Metrorail stations. Please click here to read Metro's press release about the Labor Day Weekend closures. This exhibit is one of several smaller exhibits that is part of About Change, an exploration of Latin American art from the second half of the 20th century with multiple venues around Washington, DC. 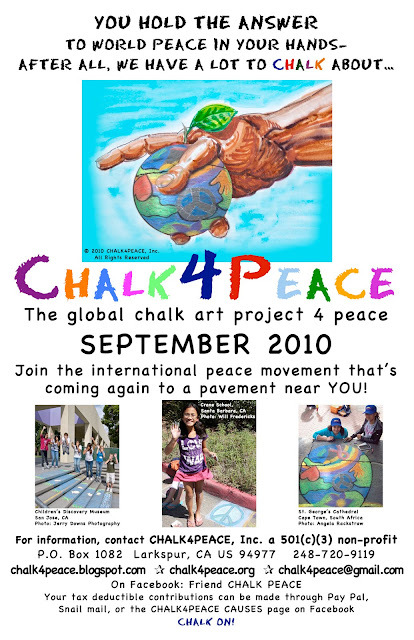 Organized by the World Bank Art Program, in association with the IDB Cultural Center and others, About Change's main exhibit opens in 2011 and focuses on the arts produced in Latin America and the Caribbean during the last decade through the works of artists 35 years of age or younger, who explore changes brought about by economic globalization and information technology. The current exhibit creates a context against which changes over the last ten years can be gauged. Since 1997 ICAF has organized the World Children’s Festival in Washington, DC. The 3-day event – the world’s largest international celebration of children’s creativity and imagination – takes place every four years on The National Mall opposite the U.S. Capitol and is free and open to the public. Hosted to honor the Arts Olympiad winners from each U.S. state and territory and from nearly 100 participating countries, the festival attracts at least 10,000 attendees. The upcoming festival in June 2011 is a timely and important celebration for organizations, companies and leaders to demonstrate their support for children and a better future for all. More than 300 educational, cultural and business leaders as well as artists, scientists, technologists and Olympians will host free workshops and activities, interact with the children, listen to their concerns, play and paint with them, inspire them and be inspired. But the children are our celebrities. They stage the festival and serve as event MCs. Young artists, musicians, dancers, and performers from across the globe showcase their talents, learn from each other, and create a nexus for the future. Closing Party for Corwin Levi and Pam Rogers featuring Miracle Berries! ADMISSION: $5 admission FREE for Members! Please join us on August 28th for the closing of Hillyer Art Space August show by Corwin Levi and Pam Rogers and a further investigation of the miracles of plant life. Theywill be hosting a miracle berry (more on "miracle berries") party where you will feel your taste-buds being turned upside down as limes and lemons suddenly taste sweet and the acidic becomes saccharine. First come first serve for miracle berry supply! In CM Dupré's Alice series' (both the first and second series of paintings are featured in her current Alice exhibit at The Art League Gallery at National Harbor) she deciphers Alice in her different stages of life, from childhood to adulthood. Fascinated by the character of "Alice" and who and what she represents, Dupré philosophically, psychoanalytically, and sociologically explores Alice's curiosity and imagination, her iconography, her ability to transform and inspire, and her pervasive existence. “Alice” is in all of us, or is she? CM Dupré will talk about her work and painting technique on Wednesday, August 25 from 7:00 - 9:00 pm. 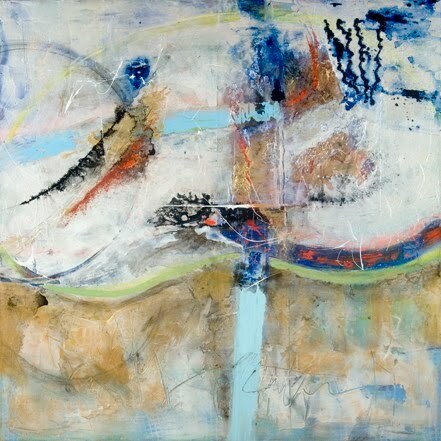 Alice is featured at The Art League Gallery at National Harbor, located at 120 American Way, Oxon Hill, MD 20745. Marking the fifth anniversary of Hurricane Katrina, this new exhibit looks at the storm and its aftermath through the eyes of the journalists who reported the story. Dramatic artifacts include boats and bicycles used by reporters to travel through flooded streets and professional and personal objects damaged by the storm. Iconic photographs, memorable news broadcasts, and newspaper front pages from around the world will chronicle media coverage of the hurricane as it unfolded and the destruction the hurricane left behind. The sketching session begins at 7pm and ends at 9pm and is free. 15 special edition blank sketchbooks for sale at the show as well but you are welcome to bring your own sketchbook. Parish Gallery (1054 31st Street, NW) is hosting a summer group show now until September 14. The artists, including Tayo Adenaike, Alex Bay, Deborah Brisker Burk, and others, represent an array of works and creative inspirations. In this show, the selected artists reshape the visual experience and challenge the viewer to look closely at how they view the world around them. Details. Painter Matthew Mann combines 14th century imagery with the cowboy archetype in a contemporary adaptation of Giotto'sScrovegni Chapel with The Cinecitta Chapel. Creating surreal and oftentimes humorous paintings, Mann interprets American-ness through the lens of Italian quattrocento painting and the gunslinger as defined by foreign-born filmmakers and writers. NOW at Night, a fundraising event presented by the Corcoran Contemporaries to celebrate the launch of NOW at the Corcoran, opening September 11. NOW at the Corcoran is a series of one-and two-artist exhibitions that presents new work addressing issues central to the local, national, and global communities of Washington, D.C., and that responds to the collection, history, and architecture of the Corcoran. Artist and Honorary Chair Chris Martin and contemporary art lovers, collector and philanthropists. Guests will enjoy a private viewing of NOW at the Corcoran’s inaugural exhibition, Spencer Finch: My Business, with the Cloud as well as the newly reinstalled permanent collection of modern and contemporary art since 1945. celebration continues with a cocktail and dessert buffet, beer, wine, specialty drinks, and dancing with entertainment provided by Bluebrain and ESL Music. The evening ends with a preview of Salon Corcoran – the museum’s lounge NADA Art Fair Miami Beach - and an after-party in downtown Washington. Martin will discuss the concepts for his upcoming NOW at the Corcoran exhibition; a luxury gift bag, and recognition on the NOW at Night Web site. ReadysetDC announces a new event series, FIFTY-ONE. Each event will have a different DC theme. The first one will on Friday, August 20th at DISTRICT in Adams Morgan and will celebrate the release of the (re)DC competition's winning "tourist t-shirt" design. If you haven't voted for a winner yet, you can do so HERE. For the 20th, HIP HOP DAN (Missile Command) at the DJ booth, as well as DJ PHIL REAL. Tickets are only $5 pre-sale and $10 at the door. Get them HERE! Get there early to grab one of the 51 limited edition (re)DC t-shirts! WPA announces a call for WPA-related ephemera to be installed as part of Catalyst, WPA’s 35th Anniversary Exhibition, on view November 9 through December 19, 2010 at the American University Museum. CATALYST will be a dynamic, narrative recollection of WPA’s legacy, showcasing selected artists, exhibitions, programs, and events from its 35-year history. The exhibition, curated by J. W. Mahoney, will include recent and period artworks, documentation in both still and moving media, a series of related performances and public programs, and a fully-illustrated catalogue. Throughout its 35-year history, WPA has produced a wealth of printed matter, merchandise and, more recently, digital images, and video related to its events and exhibitions. Much of it is now lost, but what survives acts as an informal archive of the organization’s history. We want to create a ‘wall’ of WPA memorabilia from 1975 to today that will greet museum visitors as they enter the exhibition. Loaned items will be tagged and a loan agreement issued so that they can be returned to you. There is also an option to donate the item(s) to our archives. Ephemera in digital form, including videos of WPA performances and events, will be posted on the exhibition’s website. Appropriate materials include but are not limited to flyers, posters, postcards, tee shirts, catalogs, photographs, and videos from WPA events/exhibitions. Accepted ephemera will be installed in the exhibition space or posted online for the duration of the exhibition and a list of contributors acknowledged. Juror, Dr Chris With, Coordinator of Art Emeritus, National Gallery of Art, will discuss this year's National Small Works Exhibition. His short talk will be followed by an informal Q&A session and light refreshments. Openings and Receptions made possible through the generous support of Washington Print Foundation and Barefoot Wine. 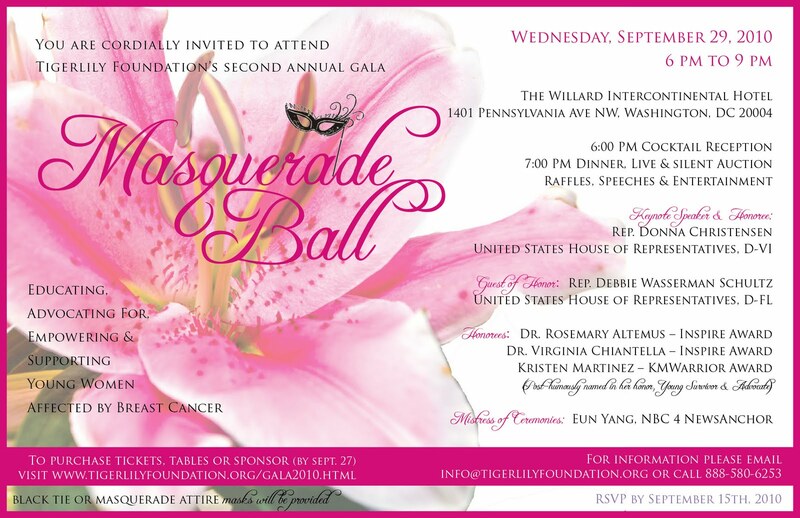 August 9 - (Reston, VA) – The Tigerlily Foundation will host its 2nd Annual Gala to raise awareness about young women with breast cancer on Wednesday, September 29, from 6-9PM at the Willard Intercontinental Hotel, in Washington, D.C. 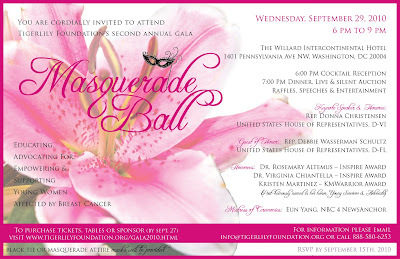 This year’s gala theme is “Pink Masquerade” setting the tone for an evening slated with live entertainment, speeches from Members of Congress, dinner, signature cocktails, live and silent auction, local business leaders, and inspirational stories from young breast cancer survivors. The Mistress of Ceremonies for the event will be NBC4 Anchor Eun Yang with feature keynote address presented by Rep. Donna Christensen, U.S. House of Representatives, D-VI. The evenings Guest of Honor will be Rep. Debbie Wasserman Schultz, U.S. House of Representatives, D-FL, who is a breast cancer survivor. The Tigerlily Foundation will also honor the recipients for the 2010 Inspire and KM Warrior Awards. Evening presenters include Natasha Barrett, Reporter, ABC 7 News, Surae Lucie, Reporter, W*USA 9, and Sarah Fraser, Radio Host, Hot 99.5. The Tigerlily Foundation’s programs assist young women around the world living with breast cancer with a variety of family and life services starting at diagnosis, through treatment and beyond. Services include education, chemotherapy buddy programs, buddy bag programs, financial assistance, meals, life management support, and empowerment services. The organization empowers them to celebrate their lives every day by harnessing their personal power. Gala tickets are on sale online for $175. Deadline to purchase tickets is September 27. Funds raised from the event will benefit Tigerlily Foundation programs. Sponsorship opportunities are available for this event. For sponsorship information or to donate items for the “masquerade swag bags”, visit www.tigerlilyfoundation.org and click on the ‘Events’ page. A collaboration of Hillyer Art Space, Words Beats and Life, DC51 Artists Collective, and the Floating Lab Collective, join Hillyer Art Space for a Sunday afternoon of graffiti, food, music and workshops. Hillyer Art Space is donating one of their walls to raise awareness for the citywide and nationwide movement to keep art alive in our schools and is inviting graffiti artists Con, Cave, Eon2, Amak, Owel and more to leave their mark. This block party type event will also feature tunes spun by DJ 4D, delectable food from Ben's Chili Bowl, and live break dancing in the gallery featuring the Double Down Queens. Come out to support this day of creativity and expression to keep dialogue evolving about the importance of art in DC schools! Advance tickets highly recommended; purchase HERE. Step into the museum’s garden for cool drinks, noshes and jazz by the Pete Muldoon Quartet. Escape the heat with gallery tours led by WE ARE SCIENCE and music by DJ Jahsonic in the exhibition Art by the Yard: Women Design Mid-Century Britain and enter to win prizes from area businesses and restaurants. Silk screen your own t-shirt or bag to take home with the Washington Printmakers Gallery. 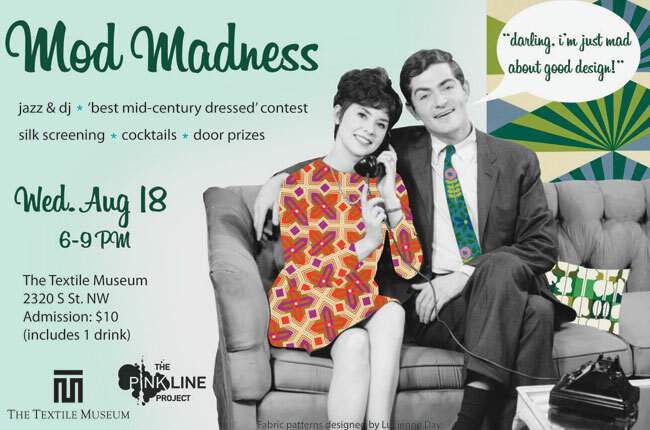 D.C.’s most fashionable will be on hand to nominate the “best mid-century dressed” – so show us your best fedoras, swing skirts and mod shifts! The Columbia Heights Community Marketplace invites artists to apply to sell their own creations at the Marketplace. *Open only to DC residents. This free exhibition presents some of the District’s finest visual artists with the opportunity to display their work in hopes of being awarded the highly competitive Artist Fellowship grant for FY 2011 in the amount of $5,000 from the Commission on the Arts and Humanities. Each artist has submitted a piece that represents their body of work and individual artistic perspective. The gathering of these artworks under one roof will promote the broad scope of DC’s cutting-edge art scene and provide an opportunity for varied artistic voices to be viewed by the public. Exhibiting Artists include: Adam Davies, Alec Simpson, Alexandra Silverthorne, Andrew Wodzianski, Anna U. Davis, Beatrice Delmonte, Bernard Smith, Bruce McKaig, Colin Winterbottom, Cory Oberndorfer, Dana Jeri Maier, Daniel Brooking, Donald Benjamin, Elaine Langerman, Elizabeth Wyrsch, Gediyon Kifle, James Brown Jr., James L. Hicks II, Jason Haber, Jenna Buckingham, Jenny Walton, Joanne S. Kent, John James Anderson, Joshua Cogan, Joshua Yospyn, Judy A. Southerland, Katharine MacDonnell, Kenneth George, Lely Constantinople, Leslie Talusan, Anne Marchand, Marta Perez Garcia, Michael Dax Iacovone, Michael Janis, Nancy Donnelly, Nicole Aguirre, Patricia C. Goslee, Patricia Tobacco Forrester, Patrick Michael Beldio, Peter Dueker, Rachel Beamer, Rania Salah Hassan, Rex Weil, Rik Freeman, Roderick Turner, Scott G. Brooks, Sean Hennessey, Sheila Crider,Sondra N. Arkin, Terrance E. Biddle, Tim Tate. Many works are available for purchase. For more information contact the artist directly. Hear Keith Ramsey speak about the passion and inspiration behind this art series. Learn how Mr. Ramsey created more than just a work of art, but an educational tool to about American history. 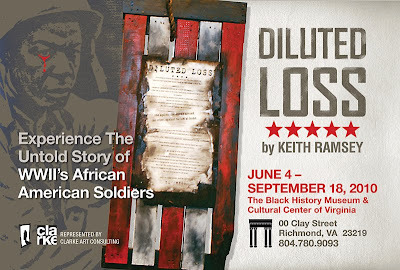 Diluted Loss illustrates the racism and discrimination that was directed toward African American troops in World War II, both from the United States military as well as Japanese and European troops. The series is mixed media, and was created using organic materials, acrylic and oil paint, snips of news articles and letters from soldiers, and other charred symbols of American liberty. Ramsey describes the series as “not a pretty picture I painted, but an important one”. Ramsey considers himself to be a documentarian, charged to present the overlooked, historical accounts of African American soldiers through art. Keith M. Ramsey grew up in Williamsburg, Virginia. The son of an artist, he developed an early affinity for the works of Edward Hopper. Since receiving his Degree in Fine Arts from Virginia Commonwealth University in 1998, he has been working steadily toward his artistic vision of images created from influences of experience, introspective thought and political perspective. 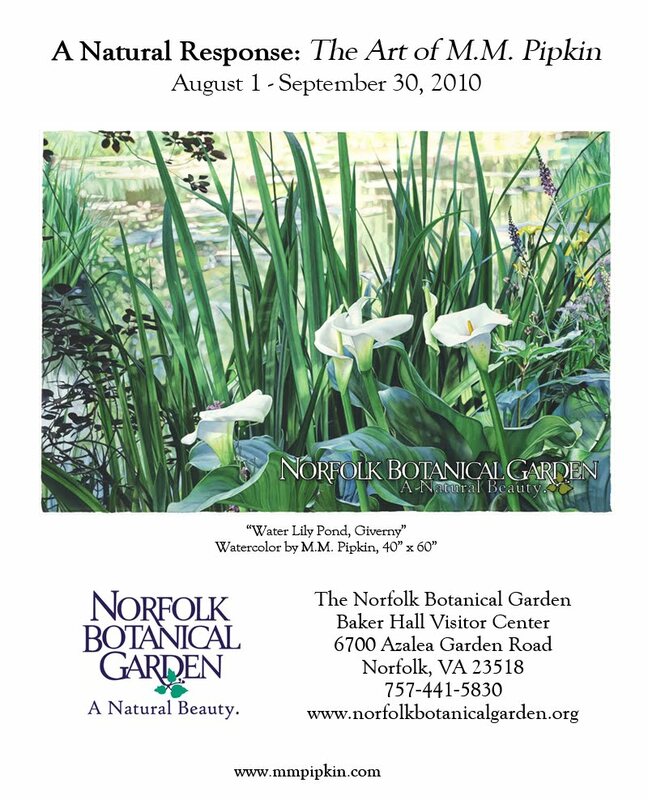 His work has been exhibited throughout the Richmond area. 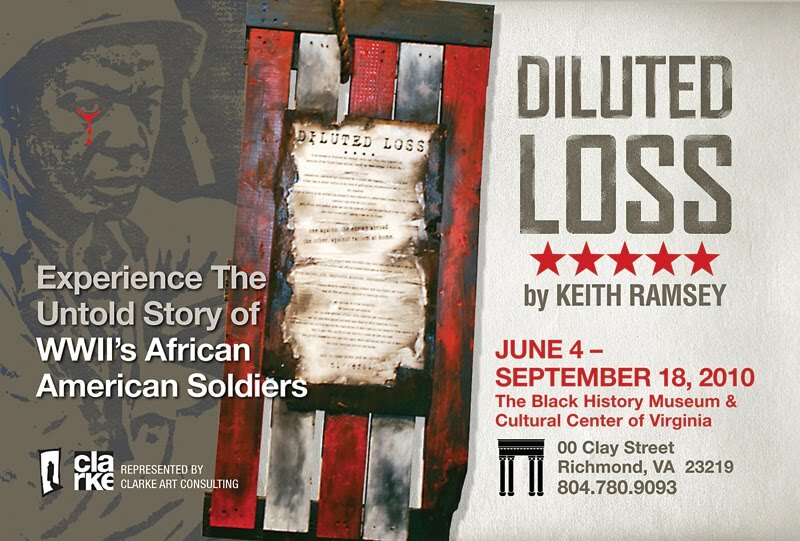 For more information about the exhibition visit The Black History Museum of Virginia. ARTIST TALKS - All Talks will start at 1pm. Let's make this Thursday, August 12th, girls night out to help some OTHER girls that need our help! Please invite all your friends so we can have a great event for this amazing charity! Gallery 555 will also be open so you will have the opportunity to see some terrific art this Thursday too. Champagne will be served so grab your girlfriends, stop by on your way home, or come down to have a great night out and do some very good work! 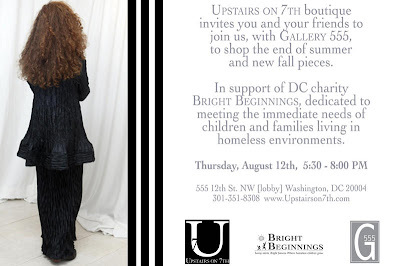 10% of all sales will go directly to Bright Beginnings. (The door to the building on 11th and F next to Potbelly's will be open until 8) - Ricki Peltzman, owner Upstairs on 7th boutique. 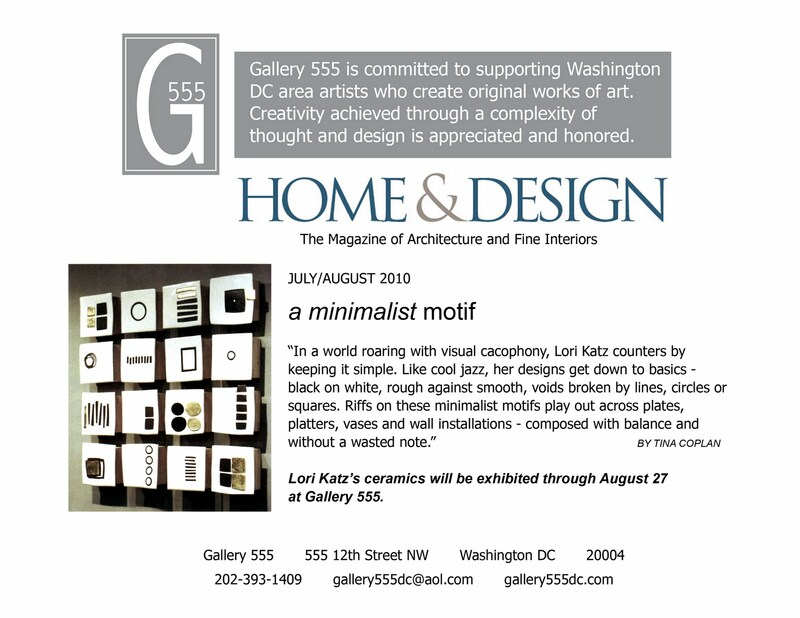 Gallery 555 features wall and functional ceramic pieces by artist, Lori Katz in August and a selection of work by area artists. You might say painter Dana Ellyn is never more at home than when she's sidled up to her easel. In her case, though, that's more than a figure of speech — where Ellyn lays her paintbrushes to dry is just across the paint-splattered room from where she lays her head to sleep each night. Commemorating its 32nd year in the nation’s capital, Zenith Gallery has extended its popular mixed-media show featuring trees in all their fabulous forms at Chevy Chase Pavilion, and added a “Meet the Artists” Reception on Wednesday, August 18, from 6-8 PM. Trees of Life II opened on April 29 and since then the art has been displayed throughout the Pavilion and in Zenith’s space on the second level next to Embassy Suites Hotel. This is the second of several shows Zenith will present at Chevy Chase Pavilion in 2010, and 10% of sales from this exhibit will be donated to American Forests’ Global ReLeaf Campaign to plant 100 million trees by 2020. Zenith’s space, second floor next to Embassy Suites Hotel. Thurs., August 12, 5–8:30 p.m. Designer Jason Wu cites Robert Ryman’s painting as the muse for his fall 2010 TSE cashmere collection. For one evening, models act as living works of art in the Ryman exhibition, bringing Wu’s designs face-to-face with their fine art inspiration. A video of Wu’s fall 2010 ready-to-wear runway show is on view in the café, and a scavenger hunt leads visitors through the museum, collecting fashion and fine art facts for a chance to win prizes. The program is part of Phillips after 5, a lively evening of art and entertainment with food and cash bar. In conjunction with Robert Ryman: Variations and Improvisations on view at the Phillips through Sept. 12, 2010. Due to the popularity of Phillips after 5, advance reservations during special exhibitions are encouraged to insure admission: $12 for adults, $10 for visitors 62 and over and students, free for members and visitors 18 and under. Reserve online until 12 hours before the event at www.phillipscollection.org/calendar. Over 70 local artists take part in this 100% hand made juried arts and crafts market. Music from noon - 2 pm with local bands. Looking for a way to display your artwork to a receptive public? Gallery West, a fine art cooperative gallery in Old Town Alexandria, VA, is looking to fill a few membership positions. Located at 1213 King Street, the gallery has been showcasing and selling its members' work for over 30 years. The outstanding spirit and group dynamic make it one of the D.C. area's most appealing artist-run enterprises. Gallery West members perform some committee work and gallery sit in an attractive light-filled space one day a month. Solo shows are scheduled approximately every 24 months, and an established mailing list of interested patrons is available. Gallery West has a coordinated marketing plan, ensuring exposure in both print and electronic media. Questions can be directed to Susan La Mont at (703) 759-7953, or Mary Allen at (540) 825-3102. Greater Reston Arts Center currently seeking art donations for Collector’s Choice. Greater Reston Arts Center currently seeking art donations for fall fundraiser, Collector’s Choice. Collector’s Choice is an opportunity to have your original artwork on exhibition in Greater Reston Arts Center's dynamic gallery. Your donation directly supports their mission of enriching community life by promoting involvement and excellence in contemporary visual arts. This fundraiser promotes the importance of art collecting and has typically been attended by over 200 art enthusiasts every year. Donated works may be selected to be included in a Silent Auction. Collectors Choice Raffle: Sunday, September 19, 2010. Contact 703.471.9242 for more information. Started in 2008 as a virtual public access forum by WPA member, Isabel Manalo, The Studio Visit (TSV) introduces professional artists at work in their studios speaking directly to their work through a dialogue with the writer. As part of WPA's Coup d'Espace initiative, Manalo and TSV will hold an open forum for artists to discuss current work or works in progress. The forum or 'Critique' will be moderated by curator and arts leader, Karyn Miller. 5 artists present new work or works in progress to discuss with a group of their peers, moderated by Karyn Miller, Program Manager for CuDC / Flashpoint Gallery. This event is free and open to the public, but space is limited to 20 guests. 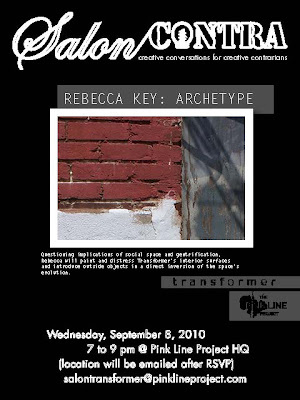 You must rsvp to kbilonick@wpadc.org to reserve your spot. bagels and coffee provided by The Studio Visit. 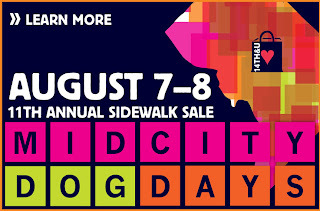 On Saturday, August 7, 2010, from 12:00 PM to 3:00 PM, as part of DC Main Streets First Saturday, come celebrate the Dog Days of August in Blagden Alley, directly behind Wagtime Pet Spa & Boutique (www.wagtimedc.com), the city's premier doggie day care, groomer and retail store and Long View Gallery (www.longviewgallery.com), which is presenting a show of the work of Tony Savoie, many of whose mixed media pieces feature canines. Bring your dog and enjoy canine contests, doggie splash pools, games, prizes, and free gift bags, dog-shaped cookies from Chatman's Bakery & Cafe (www.chatmansbakerycafe.com), popcorn from Independence Federal Savings Bank (www.ifsb.com), light fare and refreshments, and frozen margaritas. 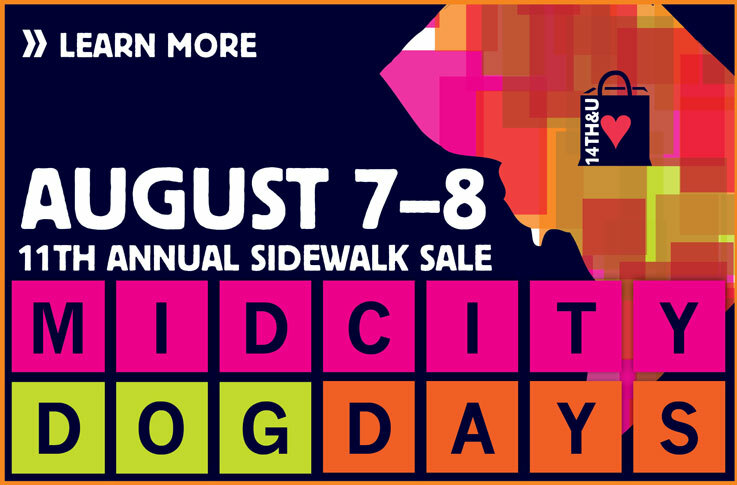 And stroll 9th Street with your pet, visiting other businesses offering dog-themed specials and tastings, including Modern Liquors. Pick up the First Saturdays event map at participating businesses and enjoy the fun. Also: Don't miss Arts on N Street, with 22 artists and craftspeople selling their work, and new art installed in windows of the Washington Convention Center. Enter alley next to Squares Fashions, 1208 9th Street, NW. FREE. DC Main Streets First Saturday is sponsored by the Department of Small and Local Business Development, DC Main Streets and the Historical Society of Washington, DC. 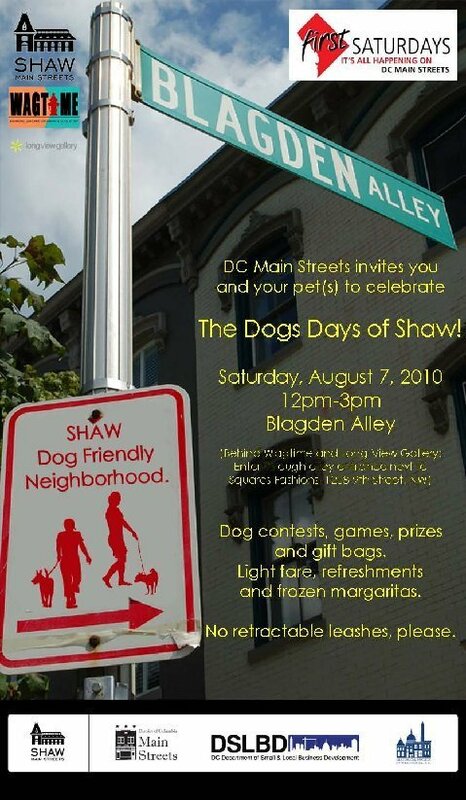 For more information, call 202-265-SHAW or email shawmainstreetsinc@gmail.com. Thursday, August 12, 6-9pm, FREE EventBrowse open studios, interact with artists, and enjoy refreshments! • Last month to see Visiting Artists in studios! Drop off school supplies for underprivileged children throughout the month of August for the 19th Annual Back-to-School Drive Sponsored by Community Partners for Children (CPC). Bring in non-perishable food items to support ongoing 2010 Carpenter's Shelter food drive! Ray Parisi will feature his Plique-A-Jour Jewelry which resembles miniature stained glass on fine silver. The art work will represent a number of different techniques. Artists interpret in fiber what we see, where we go, and the places we love. Jewelry, sculpture, clothing, and wall pieces are some of the items that will be exhibited. Fine art photography featuring work by Louise Noakes and Grace Taylor. The 'Scapes exhibit features scenes of mountains, valleys, trees, rivers and forests in a representational or abstract manner. The juror is Joey Manlapaz, professor of art at the Corcoran School of Art. This is an all media juried exhibition examining the current crises (collapse of world wide financial systems, the mortgage crisis, failing health systems) facing our country and the world, and the plight of the people who most suffer from these failures. The juror is Sarah Tanguy, an independent curator, arts writer, and critic, as well as a curator for the Art in Embassies Program, based in Washington, DC. Opening reception: Thursday, August 12, 6:30-8:00 pm. ‘Scapes was juried by artist Joey Manlapaz, instructor at the Corcoran College of Art and Design. Our landscape has been visually rendered since the beginning of time and remains one of the most venerable subjects in art. For ‘Scapes, the annual August landscape exhibit at The Art League Gallery, member artists were invited to submit works inspired by and depicting all elements of our external world. Artwork inspired by all environments is a part of this exhibit – urban and rural, industrialized and primitive, coastal and arid, and works portraying the beauty and destruction created by Mother Nature. Works of all media are included. Art League artists were encouraged to explore unique perspectives, literally and figuratively, as well as varying moods and color. Washington Projects for the Arts, in collaboration with the Rubell Family Collection + Conner Contemporary Art, presents the second annual synchronized swimming performance competition featuring Washington area artists. Prizes include: A gourmet pizza party hosted at the Capitol Skyline for you and your teammates and friends, Season passes to the Capitol Skyline pool and more! The exhibition is free and open to the public. Nearby metro stations include Federal Center and Metro Center. In cooperation with the Axent Realty Group, the Washington Sculptors Group (WSG) announces the opening of the ninth exhibition in a series of sculpture solos featured in the lobby of 1275 Pennsylvania Avenue, NW. The Sculpture 1275 series began in 2008 and provides an opportunity for the WSG to showcase the work of their membership. The curator for the 2010 calendar of exhibitions is Peter Winant, who is the Associate Director of the School of Art at George Mason University and, since 2006, has been a panelist on WETA's "Around Town" program, which offers reviews of Washington-area arts and theater events and programs. Past curators have included Anne Surak, former Executive Director of Project 4, and Norman Parish, founder and owner of Parish Gallery-Georgetown. For additional information about Sculpture 1275, visit www.washingtonsculptors.org. This exhibition features the sculpture of Chris Bathgate, a self-taught machinist sculptor who was born in 1980 in Baltimore, MD where he currently works and resides. Bathgate has spent the last decade learning how to build and use a variety of metal working tools and machinery, and has assembled an elaborate machine shop of repurposed and homemade machine tools. This includes a multitude of other equipment and inventions in the basement studio of his Baltimore home. Scenes from last night's opening reception at Long View Gallery. Great turnout, beautiful work and new collectors! Tony Savoie's work is a reverse process of painting on clear acrylic floated over backgrounds of found photographs and artifacts. His are images from the natural world with deeper implications of human interaction. Don't miss this excellent exhibition. 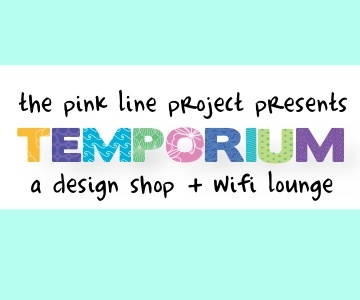 The Temporium, a design shop + wifi lounge. Store will be open through August 15. Located in the former R.L. Christian Library at 1300 H Street, NE. 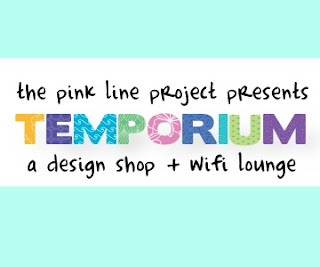 DC’s best designers show their wares in The Temporium, a design shop + wifi lounge. Artistic Sole -Skate decks, graphic tees, shoes. Buprestes – Beautiful silver jewelry with cutest bug motif ever. Dawit Kahsi – Africa-inspired graphic tees. Holland Cox – Colorful handbags, aprons, and other accessories. MiSHi – Sterling silver jewelry. Thembe Fashions – Womens clothing. Visit Gallery O/H too for "Cheesecake" and music! 10% discount at Dangerously Delicious Pies! Free food and refreshments. Sponsored by Pabst Blue Ribbon! Featuring live music by the Duc D'Angelos Quartet! Corwin Levi's flower paintings transport the viewer into a vortex of nostalgic, youthful wonderment. The fantastical imagery of his work is so visually commanding that the intensity of dreams, ideas, and space are literally punched through the canvas. Pam Rogers' work propels viewers into a nurturing, cocoon-like state of being. Using the natural world as a set focus, both her paper based and sculptural installations evoke a sense of their own potential for organic growth in the viewer. The quite nature of plants and vegetation transcend the canvas and become something of an unrequited mentor, demonstrating patience, empathy, and the innate struggle to survive. 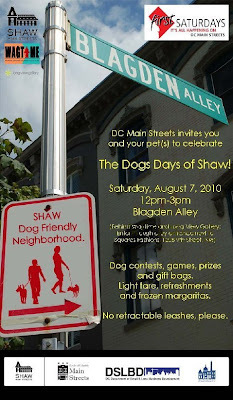 On August 7, 2010 from 2pm to 8pm at 633 E Street SE in rear alley, in walking distance from Eastern Market Metro. If you cannot attend, but would like to donate, please use their donation page. Jazz in the Garden on Friday evenings in August. The Lab for Remixed Knowledge transforms the WPA office into an interactive research space for exploring the techniques and implications of remixing knowledge. The Lab invites visitors to become researchers in the emerging fields of object-oriented thought, quantum semantics, and radical recombinance. The Lab will open and close with interactive performance lectures by chief researcher Adam Good, who will also conduct research from the Lab every Thursday during office hours, and post research findings online. The Lab will host an afternoon of presentations by guest researchers on Thursday, August 19th. 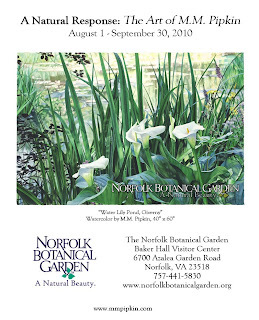 Opening reception: Friday, August 6, 6 – 8 p.m. 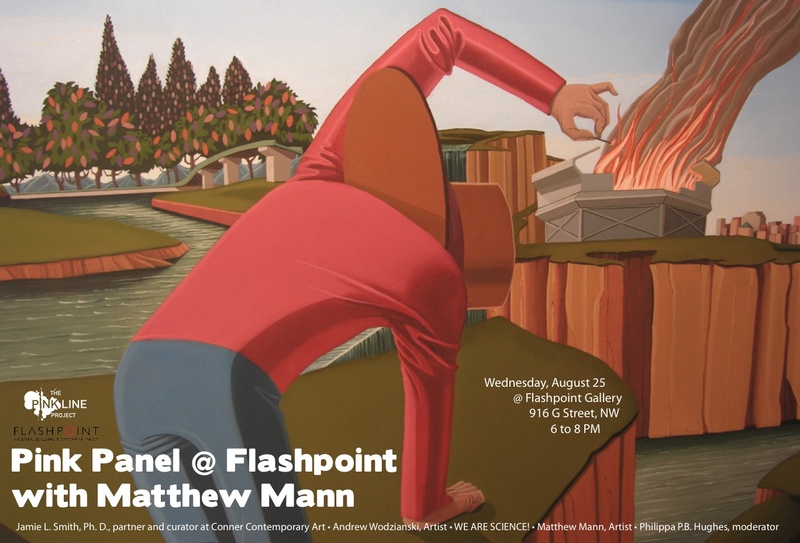 Pink Panel @ Flashpoint: August 25, 6:30 – 8:30 p.m.
Painter Matthew Mann combines 14th century imagery with the cowboy archetype in a contemporary adaptation of Giotto's Scrovegni Chapel with The Cinecitta Chapel. 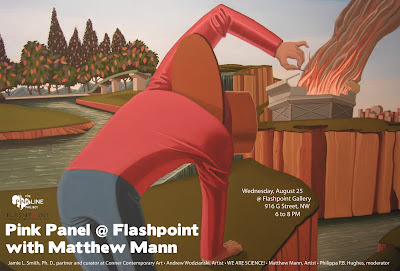 Creating surreal and oftentimes humorous paintings, Mann interprets American-ness through the lens of Italian quattrocento painting and the gunslinger as defined by foreign-born filmmakers and writers. Follow Matthew Mann’s progress at Matt’s Cinecitta Chapel Apparatus. In this DVD series, Jodi Walsh, the creator of the "12 STEP Program for Artists: The Art of Doing Business" gives viewers in-depth, user-friendly instructions on how to create a successful sales, business and marketing plan for artists of all mediums. All Talks will start at 1pm.Hear Keith Ramsey speak about the passion and inspiration behind this art series. Learn how Mr. Ramsey created more than just a work of art, but an educational tool to about American history. Read Erin Petty's article above describing the art, art incubator and retail incentives behind this project. August 7th- 8th & August 14th- 15th starting this weekend! 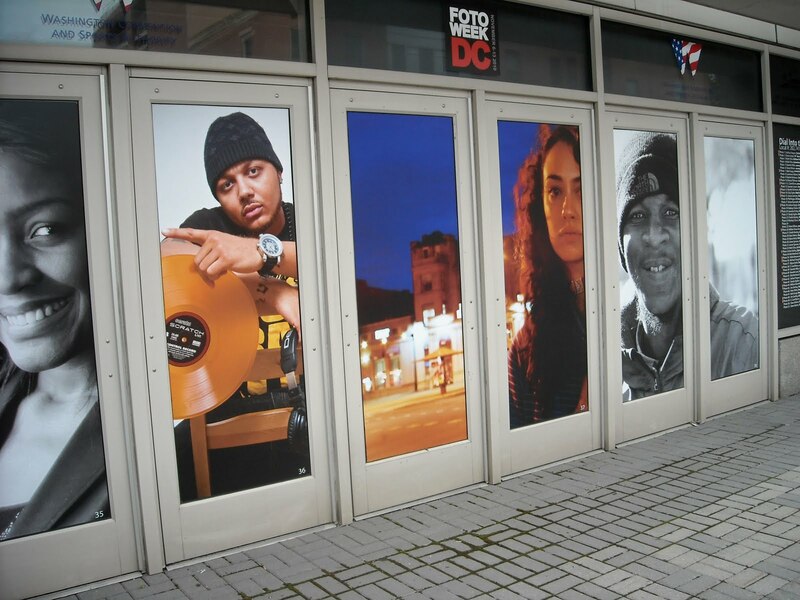 Be sure to come out to see the new Windows into DC, Phase II, on M Street @ Walter E. Washington Convention Center. It's a pop-up arts project in vacant retail windows at the convention center. My work from the Playground Series was part of the initial launch of the program last year. Artists work will be on display over a period of months to attract tourists, visitors and community members to the area. You can dial in to hear the artists talk about the work that they are exhibiting so bring your cell phones! Hosted by the DC Commission on Arts and Humanities (DCCAH) and the Washington E. Convention Center. The festival is free of charge and features art by local artists, music, fashion and local businesses. This initiative provides free spaces for artists and organizations to showcase and sell their goods, while also offering District citizens free and public art. A press conference to announce the new art happenings in and around the Washington E. Convention Center took place today and you can see a preview of some of the art in the windows at my Artravelin Flickr set. highlighting area businesses and local artists, artisans, and musicians. Along 1st Street, NW, between Florida Ave. and Rhode Island Ave. Pick up a map at Big Bear Café or Windows Café. Drink credits for first 300 people who complete the art walk. The work of local sculptors, including Sarah Allison, Mark Behme, Leah Frankel, and Eve Hennessa, will be displayed in “yard galleries,” coordinated by The Pink Line Project, along First Street, NW, between Florida and Rhode Island Avenues. Stages at each end of the walk— outside of Big Bear Café (First and R Street, NW) and Windows Café at First and Rhode Island—will feature an eclectic mix of live music coordinated by Pep Rally for Peace in the Streets. 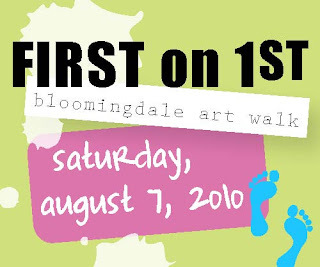 The art + music walk will also feature a local artist market, curator-led tours, and an “art hunt” along First Street. The first 300 participants to complete the hunt will receive a $3 credit for refreshments from participating North Capitol-corridor businesses. Kids’ activities will include Bloomingdale balloon artist Katie Laibstain from 12-1. Take a leisurely summer walk and experience this wonderful North Capitol neighborhood! Along the way, you’ll find outstanding sculptures and other art installations all created by DC-based artists. Live music at Big Bear Café! Funding for the event is provided by the DC Department of Small and Local Business Development (DSLBD), which fosters the economic growth and development of local, small and disadvantaged businesses. North Capitol Main Street was incorporated as a 501(c)(3) nonprofit organization in 2003 to revitalize the North Capitol corridor by investing in its commercial district. Designated an official “Main Street” program and funded by DSLBD in 2008, NCMS promotes economic revitalization for the benefit of the community through initiatives to highlight local businesses, strengthen businesses through information and training, and improve the safety and aesthetics of the corridor. The Pink Line Project is a 501(c)(3) dedicated to designing unconventional, experiential art happenings that expand the definition of contemporary art and making art more accessible, fun, and thought-provoking.